Completely renovated, this large villa of 200 sqm welcomes you to the heights of the Var Coast for a comfortable stay with family or friends. Surrounded by Mediterranean vegetation, in a large garden set in terraces, it offers its residents a breathtaking view of the Golden Islands and can enjoy a holiday for several (8 to 10 people) in a friendly atmosphere. Its location in the Mont des Oiseaux residential park allows you to combine calm and tranquility around the house. You benefit at all near a vast beach (the beach of Almanarre at the bottom of the Mont des Oiseaux). Many visits or excursions are possible according to your tastes. 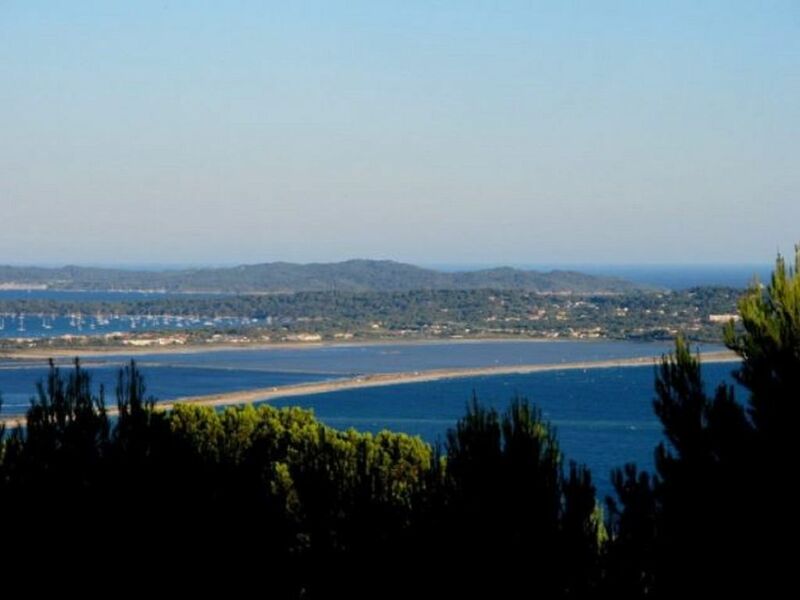 Saint Tropez, Bormes les Mimosas, peninsula of Giens, the Golden Islands ... hiking along the coast and beautiful back country with the gorges du Verdon! The location of the upper house of Mont des Oiseaux also allows you to enjoy more air and freshness, which is much appreciated in summer. The spacious outbuildings of the house and its 5 bathrooms allow to combine daily life together and individual independence. Its orientation facing the sea will make you enjoy the natural light until late in the evening. 5 bathrooms are all adjoining the rooms. Bathrooms 2 and 3 are integrated in the rooms but arranged in separation. The 5 rooms are all equipped with extra large beds. One of these two rooms ('Chambre 5') is with separate access. The swimming pool of the house, private and secure will delight young and old, and its various terraces are suitable for meals and long summer evenings. Als wir ankamen wurden wir von der Gastfamilie sehr freundlich empfangen. Es war alles sehr unkompliziert und sie hatten uns sogar den Kühlschrank mit kalten Getränken (Rose, Bier, Wasser Limonade Orangensaft usw) gefüllt was nach der langen Anreise sehr schön war. Nach einer kurzen Einweisung übergaben sie uns das Haus. Es ist ein sehr großes Haus auf einem Privatberg mit beschränkter Zufahrt. Wir waren schon dreimal auf diesen Berg aber dies Haus ist mit Abstand das schönste gewesen. Wenn wir wieder dorthin fahren, dann in dieses Haus, das ist sicher! Wir reisten als Großfamilie mit 6 Personen an. 2 Erwachsene, 3 Jugendliche Teenager und eine Großmutter. Allen aber auch allen hat es sehr gut gefallen. Jeden Morgen nahmen wir das Frühstück auf der Westterrasse ein, da diese am Morgen noch im Schatten liegt. Jede Terrasse ist mit einer elektrischen Markise ausgestattet. Abend waren wir dann immer auf der großen Hauptterrasse mit einem unglaublich schönen Blick auf den Strand von Almanarre und die wunderschönen Inseln Porquerolles und Port-Cros. Es ist ein sehr großes Haus mit vielen Zimmer. Im unteren Bereich gibt es noch 2 Zimmer mit jeweils 2 Bädern und WC. Die Ausstattung im Haus ist sehr gut und man darf alle benutzen. Uns wurde sogar erlaubt uns an der Bar zu bedienen. Die Küche hat sogar 2 Backöfen, Spülmaschine Induktionsherd mit 4 Platten, Mikrowelle, Filterkaffe Maschine und auch eine Nespresso Maschine usw usw. In einem kleinen Waschraum gibt es eine Waschmaschine mit Bügeleisen und Bügelbrett. Der Swimmingpool im oberen Bereich ist für die Anzahlt der Leute im Haus sehr groß und ist von außen nicht einsehbar. Der Außenbereich am Pool ist auch sehr groß. Auch von dem Pool aus hat man einen sehr schönen Ausblick. Pool wurde gut gewartet war immer sauber usw. Es gibt ein schnelles W-LAN eine tolle Bluetooth Stereoanlage und eine großen TFT Fernseher. Fantastic villa, highly recommend ! My family and I just had one of the best holidays at the Marcouyoux villa in Hyeres and cannot recommend this home highly enough. Christine the host was extremely reliable and kind, and made sure we had everything we needed and had no trouble answering our questions, and helping us before and throughout our holiday. The villa itself is extremely spacious and welcome. Our friends and I slept incredibly well in the Queen and King sizes beds. Its 'open plan' characteristic was perfect for us as we like to always have an eye on our children and not be confined to small spaces. The swimming pool was incredible and actually the original reason we picked the villa. In France it is mandatory to have an alarm on the pool system but this wasnt enough for us, we wanted somewhere where the pool could be completely shut off as neither of our children could swim yet. The view from the house is an absolute dream, every where we looked was like a magazine picture and we spent countless evening with our friends, sipping rosé and having lovely diners on the terrace's. It is also close to many picturesque french towns, markets, and exquisite beaches which enabled us to explore our surroundings really easily. We left the villa rested and happy and are definitely planning on coming back next summer. I just wish every rental we tried was up to the standard of this one! Highly recommend. Fabulous sea view and beautiful villa! We loved the place and the sea view! The villa, facilities, and garden were exactly as described. Christine was very kind and helpful, all communications before and during our stay worked well. She was very flexible, even though we made a last minute booking. Would definitely stay here again and can recommend this villa. Thanks! Abbiamo passato una bellissima settimana fra amici in questa bellissima casa. La vista è meravigliosa e ci siamo goduti la bellissima piscina. I proprietari sono molto gentili e disponibili e la casa è dotata di tutti i comfort. Anche i nostri due cani Carletto e Lola si sono divertiti nello spazioso giardino. Necessaria la macchina o un motorino per muoversi. Nous y avons passé un excellent séjour entre amis. La maison est belle, propose de nombreuses terrasses à choisir en fonction des moments de la journée. L'espace piscine est très grand, bien aménagé et hyper sécurisé, et une fois de plus vous fera profiter d'une vue incroyable. Merci à Christine pour son acceuil chaleureux et pour avoir su répondre à nos demandes! The house is located in the residential park of Mont des oiseaux, and at the same time on the towns of Hyères (the address of the house) and Carqueiranne. You are close to shops and the sea, and the possible activities are multiple. Water sports including proximity to the beach of Almanarre, famous place for skateboarders, kitesurfers and funboarders. Ferry to go in less than half an hour to the Golden Islands. Shopping, bowling and casinos as well as sports and cultural activities are also in the spotlight. Ces tarifs intègrent le ménage à votre départ (remise en état des lieux indiquée dans nos tarifs selon un montant forfaitaire de 150€) Ils ne comprennent pas les prestations de chauffage durant les mois plus froids (chauffage fioul et chauffage électrique dans certaines pièces) Dans ce cadre, pour toute location en dehors des périodes renseignées, nous consulter Des conditions particulières peuvent être consenties en fonction de la durée de location souhaitée.